River Vale, New Jersey – Jason Birnbaum, the golf teaching professional at Alpine Country Club, will be offering the Jason Birnbaum Junior Golf Camp this summer from July 6th to August 6th, 2015 in Bergen County, New Jersey, with equipment and apparel provided by Taylor Made-adidas Golf. Taylor Made-adidas Golf will be equipping and outfitting participants in the Jason Birnbaum Junior Golf Camp. Each student will receive a pair of Adidas golf shoes, shirt, cap, golf balls, and equipment from Taylor Made. A longtime and avid supporter of junior golf, Taylor Made-adidas Golf is at the very top of the industry and is a major sponsor to some of the top ranked golfers in the world. The Jason Birnbaum Junior Golf Camp will address all aspects of the game of golf, from full swing and short game skills to on-course playing lessons and golf course management. Furthermore, the program will work with more advanced players on preparing them for junior competitions. Under the guidance of Birnbaum and a staff of professionals, students will spend time both on the practice range and out on the golf course, learning what it takes to make continuous improvements to their game. Along with being equipped by Taylor Made-adidas Golf, participants will have the opportunity to take advantage of the latest in technology at the Jason Birnbaum Junior Golf Camp, including Trackman launch monitors. Students will also receive computer software to take home, enabling them to obtain instant feedback on their learning progress. The four-week schedule for the Jason Birnbaum Junior Golf Camp will feature classes Mondays through Thursdays from 9 a.m. to 3 p.m. Each daily session will include full swing instruction, putting and short game instruction, practice, and on-course competitions on a weekly basis. Participants have the option of enrolling for as many weeks within the five-week program as they would like, however enrollment will be limited. Weekly program tuition is $1,000 per week, with special early enrollment discounts available for $799 per week before March 15th. Pricing includes golf instruction, green fees, lunches, take-home materials, merchandise and equiment from Taylor Made-adidas Golf. Jason Birnbaum is currently the golf teaching professional at Alpine Country Club in Demarest, New Jersey, where he spends the spring, summer, and fall months. During the winter months he owns and operates the Birnbaum Golf Studio in Tenafly, NJ. Before teaching at Alpine Country Club Birnbaum worked alongside Golf Magazine "TOP 100” Teacher Mitchell Spearman at Manhattan Woods Golf Club in West Nyack, New York, where he was the director of the Mitchell Spearman Junior Golf Program from 2003-2007. The highly successful Spearman program became well known in the metropolitan area, and branched out to Westchester and beyond as Birnbaum oversaw the opening and operation of new facilities. A local resident of Oradell, New Jersey, Birnbaum’s teaching experiences have taken him around the country, where he has had the experience of traveling to different Tour stops throughout the season in order to teach some of the finest golfers in the world. Birnbaum has been featured in Golf Digest, Met Golfer Magazine, Golfweek Magazine, the New Jersey State Golf Association Magazine, and has also contributed golf instructional articles to The Bergen Record. please call (201) 655-0704 or email meghan@jb-golf.com. Thank You. "Hi Jason, hope all is well. I would like to thank you and your staff for improving Naseeb's game. He is very excited and I saw drastic improvements while playing with him." "Hi Jason, Cole had a wonderful camp experience. He loved every part, and is addicted already. Thank you so much." 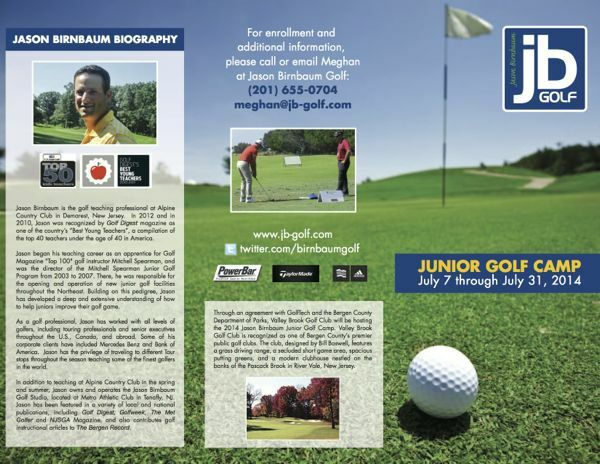 "The 2009 Jason Birnbaum Junior Golf Program was a huge success for my son. It took his game to a different level and he is enjoying the game more now than ever before. Thank you so much for your efforts. We can't wait until next summer!"